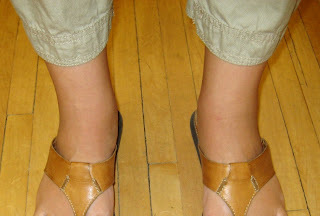 Swollen ankles... another symptom of pregnancy. Okay, this was on a day when I did a lot of walking around and standing at a conference, and if you google "cankles" you see much worse cases, but I am used to looking down and seeing nicely defined ankle bones. Don't even start with "How can you wear flip flops if you're going to be on your feet all day?" Well, these are Rockports and are more comfortable than my running shoes, which don't fit quite the same way as they did a few months ago. Cankles! It's my new swear word. Lol...I love the pictures of pregnancy symptoms! And I don't know what else other than flip flops you can wear when your feet get swollen. I lived in them my last pregnancy. Yeah, and notice how I conveniently cropped out my toenails. Must get pedicure. Oooh, pedicures are the best thing when you're pregnant, especially when you can't reach your feet anymore.